This is a easy and delicious side I like to make. Its not the quickest side dish to make, but it one of the yummiest. I absolutely love roasted bell peppers and onion with my potatoes! Peel, wash and cube your potatoes. 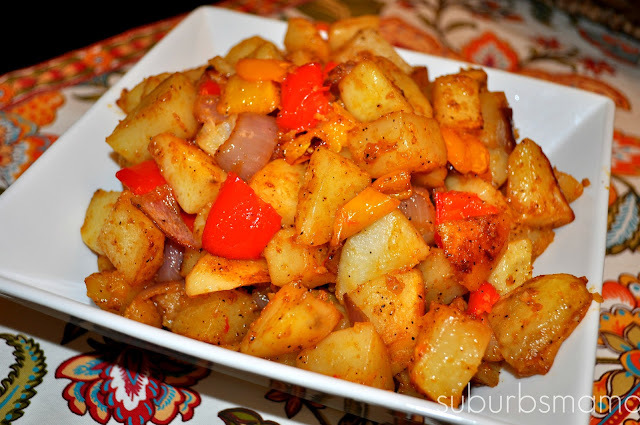 In a large bowl, combine your potatoes, bell peppers, and red onion, olive oil, garlic, paprika, salt & pepper. Spread the potatoes evenly on the prepared sheet. Remove the potatoes from oven and using a spatula, give the potatoes a good mix. Turn up the heat to 400 and put in the oven for 15 more minutes. Pierce the potatoes with a fork to make sure they are cooked through. If not, cook more.